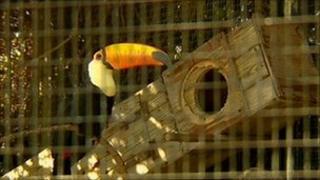 A Kent tourist attraction is to close its aviary to save the facility's £200,000 annual running costs. Leeds Castle in Maidstone plans to shut the attraction, which houses more than 100 species of bird, in October 2012. Chief executive Victoria Wallace said the money would be better spent managing and preserving the 900 year-old structure and its collections. She said new homes would be found for the birds and their keepers would be offered alternative jobs or redundancy. The aviary has been open at Leeds Castle since 1980. Ms Wallace said zoo collections were now about conservation, research and education and they would not be able to achieve the high standards they wanted without the backing of a major zoological institution. She added: "As a heritage charity, [the aviary] just doesn't fit with the many other calls on our income, which is necessarily devoted to preserving the 900-year-old castle. The castle plans to retain its collection of waterfowl and peacocks.